Click on picture for full size. Links marked with orange text. "Challenges to the mind" were popular at the Frankish court the time of the Rök Stone. Due to the political situation in Scandinavia of that time the stone was made in a combined Swedish and international context. The methods of the stone are clearly influenced by the Frankish renaissance initiated by Alcuin of York. The text is organized into stanzas fitting a front side and a back side surrounded by an encrypted frame. The stanzas contain riddles separated by the Old Norse word "sakum" ("I say") succeeded by an interrogative pronoun. Each riddle may consist of one or more stanzas. The answers are confirmed indirectly in the succeeding riddle - connecting in this way all the riddles. When "sakum" is followed by "mukmini" the riddle is a common known myth (Wessén’s "public memory"). In the other riddles all the relevant European history must be searched. According to the numbering nine riddles are missing - representing the "nine generations" mentioned just before the missing riddles. These riddles shall be searched in the stanzas outside the numbering. The result is a coherent and plausible text based solely on the translation published by Runverket. All the answers are identified in the succeeding riddle - except of course for the last riddle. The structure and the interpretation of the text correspond with the set-up of the runes and the encryption. The answers of the riddles are the mythical sword, 9 generations of ancestors, the battlefield, Siulunti, the Ingoldings and the mythical Thor and his giant son. The last stanza must refer to the unmentionable Odin, but there is no question in the last stanza – the answer is hanging in the air. The family of Vämod is identified as descendants after the Herulian king Hrodolphus, "weapon son" of the Germanic hero, Theodoric, to whom the text clearly refers. Also the historical events around the death of Vämod at Siulunti may be identified as the Danish/Frankish wars 812-815 AD. 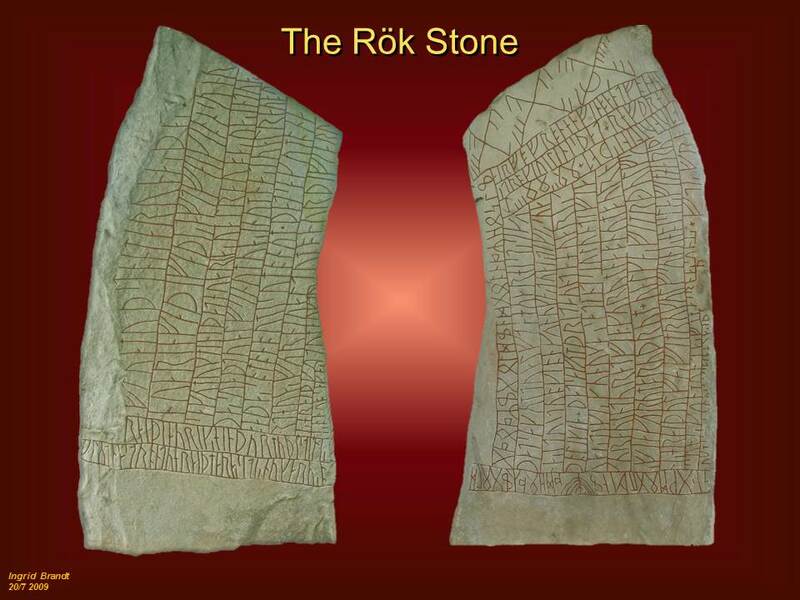 Two kennings at the rear side may refer to the reception by the gods in Valhall – basically making the stone a parallel to the picture stone in Tjängvide, Gotland. It should probably appoint the fallen son as a hero. The stanzas with these kennings are framed by the last three riddles written in encrypted runes invoking Thor and Odin - using obvious symbols and incantations which made the kennings in the middle to a part of a prayer. The problems in understanding the stone are in the pdf-article solved 100% - explained in a way which does not require linguistic knowledge. Runologists and philologists have already solved their part of the translation in a nearly perfect way, but have unsucessfully tried to make an interpretation for more tham 60-150 years. Therefore European historians or other groups working similarly in a scholarly way may have more qualifications to interpret the text as it has a much wider context than usual runestones. The interpretation was first time published in November 2004. An earlier version of this paper was presented in August 2006 at a symposium in Goetene, Sweden, together with Bo Ralph's interpretation. The papers from the symposium "Kult, Guld och Makt" were published in Danish language with English summaries in April 2007 by Historieforum Västergötland. Major adjustments since then are listed below.